Who, What, When, Where, Why? 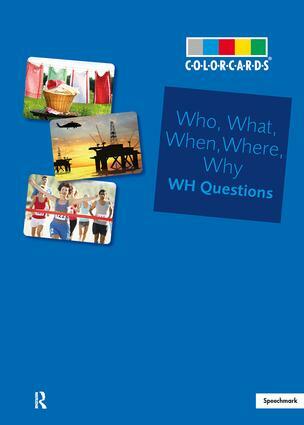 Colorcards Understanding Interrogative Pronouns What are interrogative pronouns? Where can I find a set of cards that will help me understand them? The answers can be found in the carefully selected set of cards which will provide endless opportunities to discover, understand and practise interrogative pronouns. While each card is directly concerned with a specific question all the images included provide multiple opportunities to develop this key skill. Examples of card usage include: Who …works here? …won the race? What …happens here? …can you see? When …is it time for lunch? …when will the cake be baked? Where …is the red shirt? …is my pen? Why …has the bus stopped? …are they laughing? The cards can be used in groups or one-to-one situations and are designed to help the development of key skills of exploring and understanding through language. Age: All ages Contents: 36 A5 cards; accompanying booklet detailing ways to use the cards, boxed.